flow needs of the project as you work on it. Using that information, separate the project and estimate information into milestones, determine payment schedules that finance the job with your customers' money, and let customers know payments will be due prior to starting each phase of work or you will be going elsewhere. If you do this on a consistent basis, you will never again miss out on a 2 percent, early-pay discount from your LBM dealer. MYTH NO. 4: IF I GIVE MY EMPLOYEES TOO MUCH TRAINING, THEY WILL LEAVE AND BECOME MY COMPETITION. In my professional experience, the opposite happens. e truth is, if you don't give them enough insight and experience regarding what it takes to own, run, lead and finance a real business, they will leave to start their own. Looking back, would you have started your business back then if you really knew what you were in for? In addition to offering training, give em- ployees leadership positions and mentor them at your business. is goes along with a good performance-based compensation package. Doing so will make it more likely they will stay. Early in my career one mentor put it this way: "If you think it's expensive to train employees only to have them leave, just think how expensive it will be if you don't train them and they stay." Remember, the longer these myths are be- lieved, the smaller your retirement savings will be. | my experience, if you have the right differ- ence for the right people, they will gladly pay more and thank you when they hand you your final payment. MYTH NO. 2: HOMEOWNERS WON'T PAY FOR ESTIMATES. Most contractors tell me they can't charge for estimates in their market because all the other contractors do them for free. First, I know that is not true. Many contractors success- fully charge for estimates, but most call them fixed-price proposals. If you don't know any who do, maybe you need to get out of your current box and seek new peers you can learn from. Becoming a member of NARI opened my eyes to this myth and many other myths I once accepted as fact. Remember what your mother used to say: "If all the other kids jump off the bridge on the way to school, does that mean you should jump off too?" Again, seek to be different. MYTH NO. 3: ALL CONTRACTORS HAVE CASH FLOW PROBLEMS. First, not charging enough for the jobs you sell does not lead to cash flow problems. at's called underpricing, and underpric- ing jobs means you will never have the cash you need to catch up. Cash flow problems are caused by the way your business asks for payment and/or its ability to get clients to pay when they should. Consider the airline industry: No carrier is going to let you pay after you land. at would be a risky and stu- pid policy. Completing remodeling services without being paid for them before you do them is, in my opinion, just as foolish and a huge financial risk for most remodelers. In fact, bad cash flow is the most common reason contractors fail. Instead, do your es- timates in the same order you plan to com- plete the work. Other than special-order items, this will help you predict the cash yths have sadly become truths for too many remodelers. Believing in these myths is unfortunately holding many back from being able to grow their businesses. It can mean the difference between creating a comfortable retirement for yourself or a mediocre business that may require you to work until you die— or at least until your body wears out. And, what if your body wears out before you have enough money to retire? Here's the thing about myths: After believ- ing something to be true for so long, many people actually purposely ignore real evidence that what they believed is not really true. As the "Seinfeld" character George Costanza once said, "Jerry, just remember: It's not a lie if you believe it." Here are four common remodeling busi- ness myths that, in my opinion, are easily debunked with logic and/or evidence. If one or more of these is holding you and your business back, I suggest you move from remodeling myth to reality. MYTH NO. 1: I HAVE TO BE COMPETITIVE ON PRICE TO SELL JOBS. is one is true if you are what I call a "commodity contractor." 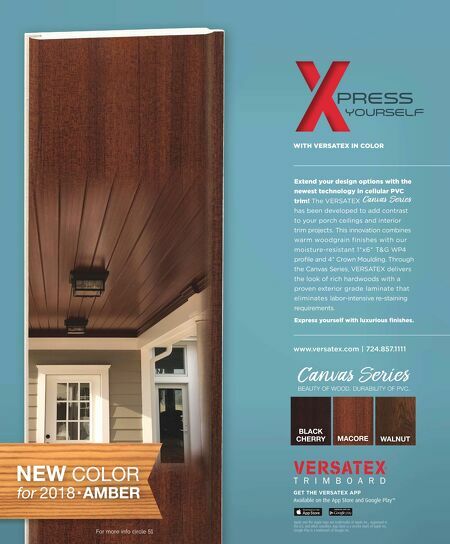 If you don't do marketing to expose how your business is different, you will be perceived by home- owners as being the same as most other con- tractors. Like selling regular gas, a lack of differentiation puts you into price competi- tion to get customers. Low-price gas stations make money on volume. Most contractors can only handle so much capacity, so being a commodity contractor really limits their earning capacity. If, on the other hand, you are different—perhaps the only one in your marketplace who does what you do—and if people want your difference, you can charge more and they will have to pay to get it. 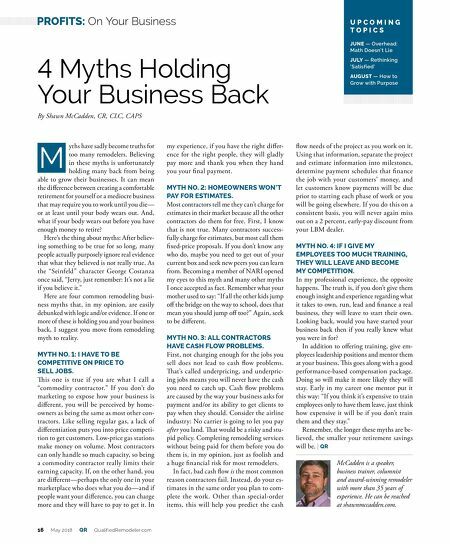 In 4 Myths Holding Your Business Back By Shawn McCadden, CR, CLC, CAPS U P C O M I N G T O P I C S JUNE — Overhead: Math Doesn't Lie JULY — Rethinking 'Satisfied' AUGUST — How to Grow with Purpose M 16 May 2018 QR QualifiedRemodeler.com PROFITS: On Your Business McCadden is a speaker, business trainer, columnist and award-winning remodeler with more than 35 years of experience. He can be reached at shawnmccadden.com.